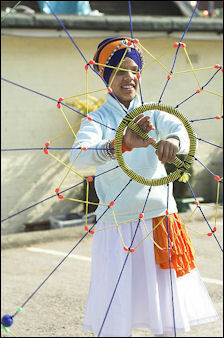 By some reckonings Sikhism is the world's fifth largest, and one of the youngest, religions. It blends Hindu tradition and Tantric yoga with mystical Muslim beliefs. Unlike Hinduism and Buddhism, it is oriented more towards living in the existing world than doing everything for future lives. Foundations of Sikhism including inward devotion, monotheism, and the belief that god is everywhere and he can be perceived with an inward eye. Mantra-like chants such as nirankar (formless one) are repeated as a form of worship. Sikhs believe in one God, and emphasize the absolute sovereignty and unity of this god, whose name is ik, which is numeral not a word for God, and who is equated with truth. Sikhs believe that he created all things and that all things are dependent on God’s will. Sikhs reject the caste system, Hindu divine incarnations, the worshipping of images, and the sanctity of the vedas. They are not allowed to belong to any other religion. The Guru Granth Sahib is the 1,430-page Sikh holy text. Also known as Adi Granth, meaning "The Book," it is comprised of hymns written in Saint Bhasha, a language related to Hindi and Punjabi. The original Granth, which consisted of 29,480 rhymed verses, was assembled in 1604 by the Fifth Guru, Guru Arjan, from inspired poetry composed by himself, Guru Nanak and other early Sikh gurus. Most of the book’s contents are hymns, organized in 31 sections, that follow musical scales known as ragas. The 974 hymns composed by Guru Nanak form the heart of the book; the other hymns are essentially elaborations of points first raised Guru Nanak. The Tenth Guru, Gobing Singh, designated the Guru Granth Sahib as his successor thus ending the succession of human gurus. To this day Sikhs recite: “Acknowledge the Guru Granth. Acknowledge as Guru, the manifest body of the Gurus.” There are different ways to read the Guru Granath. Sometimes the entire book is read over a 48 hour period. Sometimes guidance is sought by opening the book randomly and reading the hymn on the left had page. At temple gathering passages are read by Sikh officials known as a granti who also look after the temple. The second most important Sikh text, the Dasam Granth (Granth of the Tenth Guru), appeared a hundred years after the Guru Granth Sahib, with 37 authors contributing to it. When it was written Sikhism was in the process of trying to embrace other religions and expand beyond the Punjab and thus its original texts were written in Hindi, Persian, Punjabi, Multani and Prakrit. Few Sikh could read and understood all of its verses. the SIkh martial art Sikhism and Hinduism share many similarities and many Hindus consider Sikhism to be a branch of Hinduism and even insist some of their children are raised as Sikhs. Sikhism embraces the Hindu concepts of karma, rebirth and prasad. Sikhs believe an individual passes through five stages beginning with 1) manmukh (an evildoer who puts and emphasis on materials an indulges in five deadly pleasures similar to the Christian deadly sins) and ending with 4) gurumukh (being absorbed into the Guru) 5) sackand (utter bliss, beyond rebirth). Salvation and Sikh enlightenment are reached by attaining harmony with god and rejecting the unreal attachments of the world. Reaching harmony takes discipline. It is not reached through rites and pilgrimages but through internal worship. Sikhs believe in reincarnation but believe the cycle ends when one is born a man. Sikhs are expected to find a place in the world and incorporate God and their religion into their everyday life. There is strong emphasis on participating in a community and engaging in community service, with much of it focused around Sikh temples. Political and social life are mixed with spiritual life. Sikhism is egalitarian. Men and women are of equal status. Women can become priests. Decisions are made by the entire community in an open forum. Everyone is known as sadar (“leader”) and everyone eats together in the community kitchen. Priests and temple managers are elected democratically. There is no ordained priesthood. pilgrim at the Golden Temple Sikh temples are called gurudwaras, or God’s portals. In the inner sanctuary of the temple is a copy of the Guru Granath. Generally there are no images of the Gurus. Many Sikh temples, shrines and holy sites are associated with major events in Sikh history. Sikhs are expected to give ten percent of their earnings to their gurudwara. Regarded more as places for communities to gather than places of worship, Sikh temples typically have a library and rooms or buildings for social events in addition to an elaborate worship hall. Many Sikh temples have sports facilities, schools and clinics with free medical service. Sikh temples have community kitchen and eating area called a langar, which serves up free vegetarian meals that can eaten by anyone regardless of nationality, race, caste or religion. Langers are an expression as Sikh devotion to service and charity, with temple members giving what they can and taking what they need. In the langar everyone sits on the floor while eating, a custom initiated by Guru Marak as a rebuke to caste system traditions which prohibited members of different castes from eating together. Langar (“anchor”) refers to food, the kitchen and the eating area. Before entering a Sikh temple worshipers must wash their feet. In the Golden Temple Sikhs touch their forehead to the ground, offer coins and receive sacred food. Chanting and singing of hymns, or kirtan, go on around the clock except for a brief break at midnight. The waters around the temple are regarded as sacred, the Sikh equivalent of holy rivers like the Ganges. Distributing prasadam Sikhs do not put so much emphasis on ritual. Guru Nanak thought many rituals were empty formalities. He encouraged people to look within themselves for meaning. 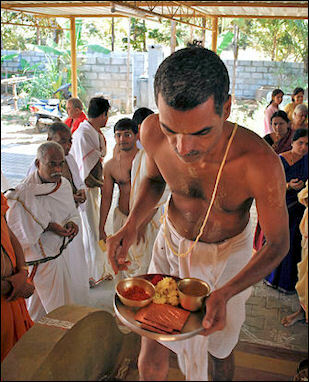 Prayer is considered important and is practiced at both home and temples. Daily recitations of certain texts, namely verses from the Guru Granth Sahib, are said after bathing and getting up, and during daily family gathering, and attendance with the Khalsa at the temple. During readings of the Guru Granth Sahib some Sikhs ceremoniously wave yak-hair whisks across the altar while others read from the holy book and collect donations. Sikh homes have altars with prints of Guru Nanak and the other gurus, seemingly in defiance of the Sikh prohibition on the worship of idols. Devout young men are baptized. Sikh dead are cremated. During the funeral the evening hymn is sung. The Guru Granath is often read from beginning to end by members of deceased’s family, a ritual which generally lasts from seven to ten days. Baisakhi, on April 13, is one of the most important Sikh religious holidays. It commemorates the establishment of the symbols and rituals known as the Khalsa Panth in 1699 by the 10th and final guru, Gobind Singh. Temples hold 24-hour readings of Guru Granth Sahib. Men and women prostrate themselves in front of the holy scripture and collectively eat a meal of curry, lentils, potatoes, pudding and rice prepared in a huge vats that holds several hundred liters. The festival often features processions and kirtan devotional music. Baisakhi also honors The Five Beloved Ones, the first five men initiated into the Khalsa Panth. At a fair Guru Gobind asked if anyone was willing to give their life for the Sikh cause. Five men volunteered. Guru Gorbind entered a tent with the five men and emerged with blood dripping from his sword. Everyone thought the men had been killed but in fact they had been initiated. Other important festivals include the Martyrdom of Guru Arjan in May, the Celebration of the Guru Granth Sahb in August, Diwali and Guru Nanak’s Birthday in October and the martyrdom of Tegh Bahadur in November. The Khalsa military fraternity of orthodox Sikhs dominates Sikh public life. They strictly follow the Sikh code of conduct and undergo a baptism. Their community is known as amritdhari (“those who have undergone baptism”). 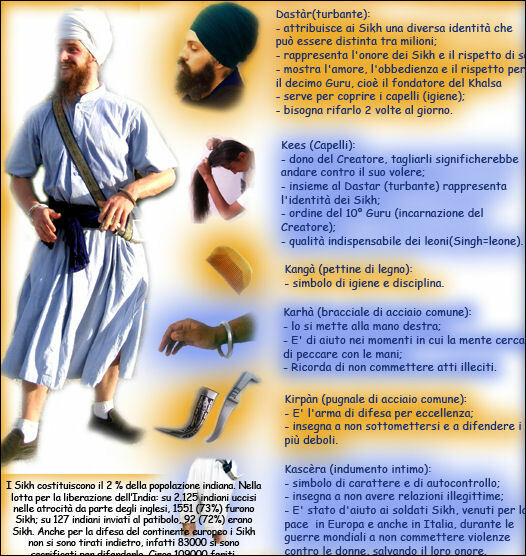 Khalsa initiates are required to drink a cup of sweetened, sacred water called amrit (literally “undying,” the nectar of immortality) and take the surname Singh. 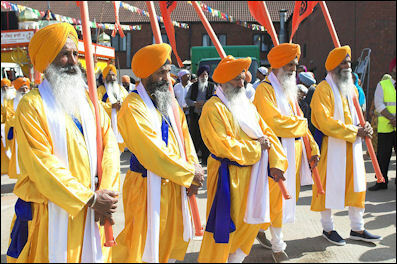 During the initiation ceremony, which usually takes place in the morning during the Baisakhi Festival, initiates dress in orange and white are recite certain hymns. The initiatives are usually adults. In the 18th century Sikhs were taught to observe the Khalsa Panth, or the "Five K's” as signs of allegiance with the Sikh community. They are: 1) kesh (having uncut hair); 2) kangha (holding the hair in place with a comb to remind Sikhs of their stewardship responsibilities and to symbolize cleanliness); 3) kirpan (wearing a dagger to symbolize the fight against injustice); 4) kara (wearing a steel bangle to represent the unbroken link with God and to symbolize responsibility); and 5) kachh (wearing a special underwear that resembles breaches that don't go below the knee to symbolize cleanliness, physical activity and sexual fidelity). 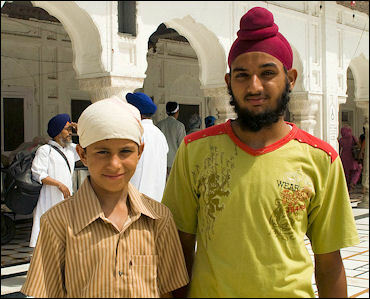 Sikhs regard hair as a symbol of God's creative beauty. Devout Sikhs believe that no hair on any part of the body is to be cut. Beards are uncut and turbans are necessary to cover the uncut hair. Modern militant Sikhs have added a revolver and bandoliers to this outfit. Text Sources: World Religions edited by Geoffrey Parrinder (Facts on File Publications, New York); Encyclopedia of the World’s Religions edited by R.C. Zaehner (Barnes & Noble Books, 1959); Encyclopedia of the World Cultures: Volume 3 South Asia edited by David Levinson (G.K. Hall & Company, New York, 1994); The Creators by Daniel Boorstin; A Guide to Angkor: an Introduction to the Temples by Dawn Rooney (Asia Book) for Information on temples and architecture. National Geographic, the New York Times, Washington Post, Los Angeles Times, Smithsonian magazine, Times of London, The New Yorker, Time, Newsweek, Reuters, AP, AFP, Lonely Planet Guides, Compton’s Encyclopedia and various books and other publications.